Wrasses is a large family that belongs to the Labridae type of marine fish. 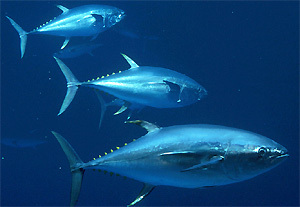 There are one of the largest marine fish families, with 500 species in 60 genera. They are famous for their bright colours. It was first described by Cuvier in 1816. 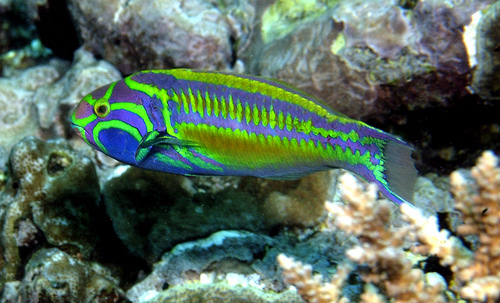 The name, wrasse, derives from the Welsh word of ‘gwrach’, which means hag or an old woman. Wrasses live in the Pacific, Indian, and Atlantic Oceans and stay in shallow waters such as rocky shores or coral reefs. Wrasses are usually less than 20 centimetres long. The largest wrasse is the Humphead wrasse, which can grow up to 2.5 metres long. They are dimorphic, meaning that they can change gender. Adults are quite territorial though. 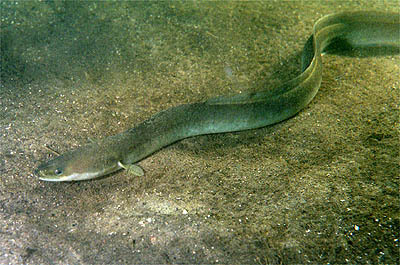 They are carnivores, and feed mostly on small invertebrates. 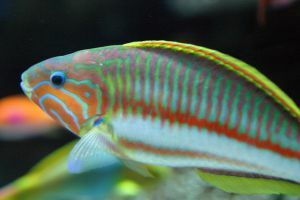 However, many of the smaller sized wrasses follow the feeding trails of large fish and pick up invertebrates that are disturbed the passing of these larger fish. Wrasses have protractile mouths. This means that they have a separate jaw of teeth that juts outwards. Their jaw structure is studied for fish-feeding biomechanics. This is because their jaw configuration provides a forceful bite. Some wrasses form symbiotic relationships. There are wrasse cleaning stations at coral reefs, so other fish will wait for these fish to swim into their open mouths and gill cavities in order to remove gnathiid parasites. Cleaner wrasses also feed on dead tissue and scales that have ectoparasites, although sometimes they ‘cheat’ their client by eating healthy tissue and mucus. This is costly for their client fish to produce. The most commonly found cleaner wrasse in tropical reefs is the bluestreak cleaner wrasse. Sometimes cleaner wrasses are eaten by predators because parasite removal is more important for the predator rather than eating the cleaner. Believe it or not, some species of wrasses make “house calls” instead of staying at their fixed locations. This is because their “clients” are either too shy or too territorial to go to a cleaning station. Humans do eat wrasses. Tautog is a common food species in the western Atlantic. They can be found in home and public aquariums.